Slash your laundry supply bills and extend the life of your clothes by making your own laundry soap. 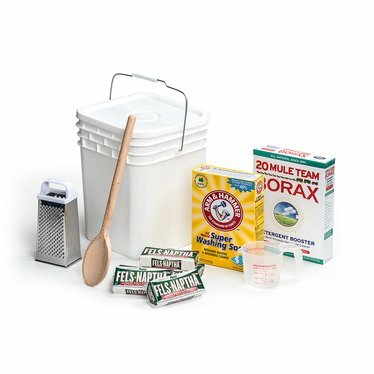 Our starter set includes everything you need to make several batches - enough to wash more than 800 loads at about 7¢ per load. Just a few old-time ingredients will get your laundry cleaner, for less money. Note: Our included recipe requires heating the ingredients on your stovetop to make a gel-like soap. Use approx. 1/2 cup per load. When you run out of an ingredient from starter set, simply reorder what you need. Homemade soap is gentle enough for those with sensitive skin, easy on fabrics and the environment, too. Received my kit yesterday. At first I was a bit put off by the boxed powders being clumpy (didn't take that long to set right), and the bar soap and powders being dated 2015. Then I thought to myself that many folks put ingredients by for several years before using them, and it should not effect the end product that much at all. I gave it a try, but reduced the amount of water called for in the recipe just a touch. The next morning, the result was wonderful, a thickly jelled bucket (made a double batch) of laundry soap that smelled great. I did laundry, and have to say, this has the store-bought stuff beat ten ways to Tuesday. We have hard water, and it really does help brighten things up. The fragrance is clean, not overpowering to me at all. It reminds me of being at my grandmother's house on wash day. Good memories, and super product. Thanks for having it available. Very convenient to have everything all together to begin making my own laundry soap. I have been doing this for years except I add 1 giant box of Baking Soda. I put the bar soap in the microwave for 8 seconds to soften before grating. I then mix in a gigantic Tupperware Bowl and then pour into a container and leave in powder form. I use a scoop per load. Sometimes I add plain vinegar as a laundry booster. For some reason my detergent didn't gel & it has been 3 days, supposed to set up in 24 hours. I checked the amount of water it calls for about 20 times & had someone read the directions also & they came up with the same amount. It gelled a little & gave it a stir after the 24 hrs but is still almost all liquid. Did my directions call for too much water?? Very excited to use this!! Lehman's says: Thanks for contacting us and letting us know about your experience! We're looking into this issue. I was wondering if anyone uses this in their HE washer? If so, how much? After it sets up to a gel, you can put in blender and turn into a liquid. Just shake jug before using. I used it in dishwasher too, it has low suds, works great. I am so glad I started making my own laundry soap! Everything really does smell so much cleaner, and the dinginess from our hard water is coming out of our clothes. It is frightening to read the chemicals included in the expensive store bought detergents. I'm sticking with this method. Only takes a few minutes to make a batch that lasts months! This is absolutely wonderful for my husband who is allergic to most laundry soap. We've been using this for months now, and he hasn't had any problems. Saved us a ton on hypoallergenic detergent! I've always been a Tide, Gain type of person. I started using this recipe three years ago. The basis recipe is great, I do add oxiclean, purex crystals,or dry bleach to some of my batches. It's safe in all types of washers. I also use this for a all purpose cleaner around the house. You won't regret this product and the smell is so clean. As you use this cleaner you'll find your clothes will be much cleaner then anything on the market can give you. For whites to get whiter you can also add 1/2 cup dry dishwasher soap to your laundry for a great booster. Don't hesitate to start, I have several friends and co workers that are now making their own laundry soap. This is wonderful! Saves me money and my clothes have never been cleaner. I have an allergy to most laundry detergents but have no allergic reaction to this at all! I love it! I really enjoyed using this homemade laundry soap. The laundry is so clean smelling. As a matter of fact my friends who don't want to make their laundry soap themselves, pay me to make it for them. That's how much this soap is liked! Thanks again! The washing soda, borax & fels naptha in this kit lasted me from 12/11/2010 to 3/14/2013. That is amazing!!! This did laundry for two people & 1/2 of the time a 3rd person for all of that time. If you are looking for a way to save money this works! It doesn't matter if I use my wringer and hang to dry or if I use my water-miser front loader in the winter..the clothes just come out clean and not perfumy. This is a good kit to get started with. WOW!! Seriously, how do you save money by buying this for $54.00 from you when the same items can be bought at the local farm store for less than $15.00? Shame on you for extorting people!! We love this soap and the kids enjoy making it. We use a hand-crank washer and the clothes smell and feel clean. I feel comfortable in dumping the soapy water on the lawn (seems to like it). Use about 1/2 cup per load. Every time I make a double batch for my in-laws. We all use it on rags for cleaning purposes, too (toilet and sink area). We sometimes add in vinegar to the load for wet items that have gone wrong (kids leaving wet socks in forgotten places). Other than that, we love having one more product that we can use without supporting large retailers. After doing much research I decided to try making my own laundry soap. This kit is by far the best and easiest way to go about it and the pail had everything to do it with. Your clothes will get clean and your washer won't be strained with extra suds, you won't be over using water. It's the real deal! We love this laundry soap. After spending extra money for years on eco-friendly laundry detergents this is a breath of fresh air. It is easy to make, and lasts forever. I dont spend money on spot removers or fabric softeners anymore either. If i do have a difficult stain I use the fel-naptha by itself with my wonderful glass scrubbing board I bought here also. Wonderful product! I just love this homemade laundry soap! I used to balk at the idea of making my own laundry soap but we are trying to save money. Commercial laundry detergents are so expensive so we decided to give it a try. I love the scent of the soap and it cleans so well. I especially like the idea that the clothes smell clean and not like the laundry soap itself. I look forward to making my next batch just so I can smell the Fels-Naptha soap! (It smells so good! I am so glad that i bought this kit from Lehman's . I had always wanted to make my own laundry soap. The kit provides everything needed and the recipe was included. I made the soap and used it after letting it cure for 24 hours. I was very pleasantly surprised at how clean it got the laundry. It far surpassed the store bought detergents and the fact that it is safe for the environment is a plus. If you have well water, like I do the last thing you want is a chemical laden laundry detergent seeping into the ground and contaminating your well water. Thanks Lehman's for making this product available and allowing me the opportunity to learn to make my own laundry soap. So far so good! I enjoy having homemade soap. It cleans well and does not have a strong fragrance. The Fels-Naptha is great for stains. My son cut his lip and bled on my NEW shirt. I treated it within the hour and the stains came right out. Absolutely a breeze to operate and it is so fast and neat. I definately will give this a lot of use on next years Cherries. Thank you once again Lehmans for giving the public such wonderful tools. The smell of the soap is wonderful. And it was so simple to make, I was using it almost immediately! My clothes are cleaner and brighter after just one wash - this is great stuff! I've been making my own laundry soap for a while, using the same ingredients, and I can say it is a wonderful, economical way to get your clothes clean. It's good to know I can easily get replacements from you when I run out. The only thing I add is a handful of salt (I use the water softener salt) per load to soften the water, as we have very hard water. I can't believe I wasted all those years buying detergent! I made my first batch using this kit recently, and it was quick, easy, and barely made a dent in the supplies - the $50 spent here will last us quite a long time, I think. Like some others, I am finding that we need to use a bit more than the recommended amount to completely wipe out odor, but with such a large supply, it's not a concern. I highly recommend it! I LOVE this laundry soap. I enjoy making it and I enjoy using it. No suds and it cleans the clothes. It is well worth the money. The clothes smell clean and I like that. The first thing I noticed about this homemade laundry soap is the wonderful--I hesitate to say fragrance but, for want of a better word--fragrance. It's not the synthetic fragrance of most commercial brands but just a really CLEAN scent--even the cabinet where I store it when not in use smells wonderful! It is easy to make, taking hardly any time at all, and easy to use. Best of all, it really works! Thank you! All I can say is WOW! SOOOO simple to make and it just WORKS!!! Without any additives (OxiClean, or bleach) my whites were noticeably whiter and everything was clean without any perfume scents. LOVE it! I received my laundry soap starter and made some that day. It smelled a bit strong but it was a good smell. It is going to be kind of hard to get used to not having laundry detergent that suds but it worked and that is what mattered. I am very pleased with this. Thank you! I only give the Homemade Laundry soap a 3 of 5 because for large loads I have to use 2 cups of soap to get the sweat smell out. We are landscapers and sweat is what we do. Dirt and grime come out better also. I purchased this wonderful set and quickly whipped up a double batch when it arrived. The instructions were easy to follow, and the results were fantastic! My clothes are clean, fresh, soft and stain free. No more rings around my husband's collars! Sweat stains on my son's shirts are long gone! I will be buying refills for theis kit again and again! Have been pondering getting this kit for quite a while and now I'm sorry that I waited so long! Love the way it cleans, it is so easy to make and REALLY love the $$$$ that I'm saving every month. When I ordered this Set, I was a little concerned that the work involved in making my own laundry soap would become a hassle. I've made it twice and enjoyed the process greatly both times. I actually look forward to laundry soap making day and my kids are pretty fascinated by the process and enjoy watching. I'm perpetually looking for simple ways to be wise with our money, honor the gift of the wonderful planet we live on and improve the effectivity of my work. Using this kit absolutely fits that bill! I am gratified in every way, to have implemented it in my life.